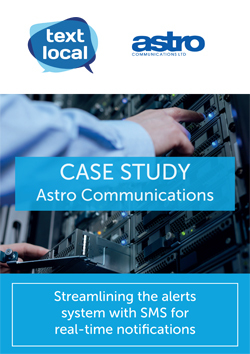 Astro Communications are experts in solving business challenges through communications and networking solutions. The small, boutique company have been providing innovative IT, ISP, connectivity solutions since 1984 and currently employ 30 staff who work as extended members of their customers’ teams. Staff were struggling to identify the highest priority emails as alerts are sent from each server the company manages whenever there is an update or issue. This means that some more urgent emails like restaurant servers going down, meaning no payments could be taken, could be lost amongst the hundreds received. Additionally, those doing on-call shifts were concerned about missing urgent issue emails overnight. An SMS alerts system was created to notify senior management and engineers if they detect an email of high priority. The system sends an SMS when the event occurs with a reminder after five minutes if the first is not acknowledged. Another text is sent once the issue is resolved. For their high-security clients, such as those handling credit card payments and hospitals, using multi-factor authentication, a PIN will be sent via SMS from the firewall to ensure it is the right person using the logins.